Sorry about the delay in posting this, life got away from me and it’s been hard to find time in the shop. The last blog left off by starting to assemble the door and dealing with some minor frustrations from the roundover bit I used. If you were wondering, I decided not to rebuild the frame for the door. Instead I sanded most of the imperfections out, starting at 120 to remove as much as I could without completely sanding through everything, and then moving up through the grits to 220. Overall it worked out ok, I’m sure most people won’t notice it, but I do every time I look at it. Once I had the door sanded out decently I decided to finish up the assembly before moving on to other parts of the cabinet. 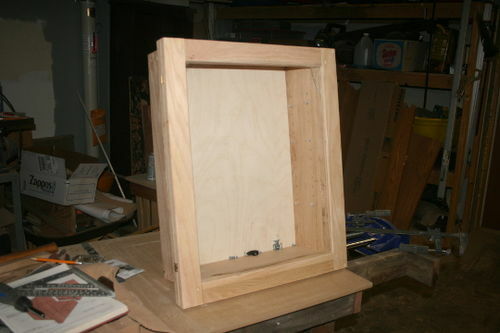 The plans in the book call for a mirror backed with a piece of 1/4” plywood. At first I thought a little mirror cabinet would be nice for my daughter to use in her room, but my wife veto’ed me on that and asked if we could put a piece of clear glass in it. She wants to hang it over her craft table and use it to store some of her materials. I made a quick trip to the local hardware shop and picked up a piece of window glass. They only had 1/8” and I didn’t feel like making an extra trip to the glass shop. Back home I inserted the glass into the grooves in the door frame, slid in the top rail and glued everything up. Because the groove was cut to accept a 1/4” thick mirror I had to shim the glass in the corners using thin pieces of oak cut offs. It seemed to work relatively well, holding the glass tight in the frame. 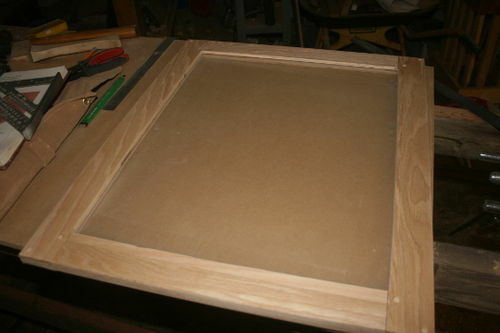 With the door done, I set it aside to let the glue dry and turned my attention to routing out the back of the cabinet to accept the back panel. Using a 5/8” rabbeting bit, I set the depth for a little deeper than 1/4” to accept an 1/8” thick panel. 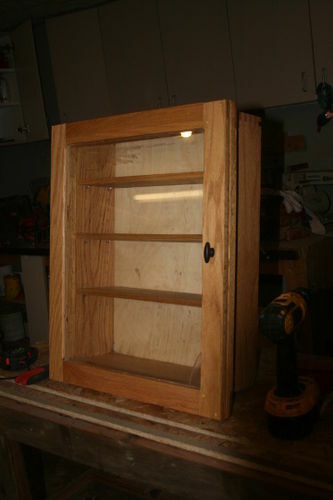 I wanted the cabinet frame to sit a little proud of the back panel so that the cabinet would hang flush to the wall. The first pass got a little squirrely, not a big deal since it will be hidden against the wall. Next time I think I will set up some kind of auxilary board that the router can ride on to get a little more stability. 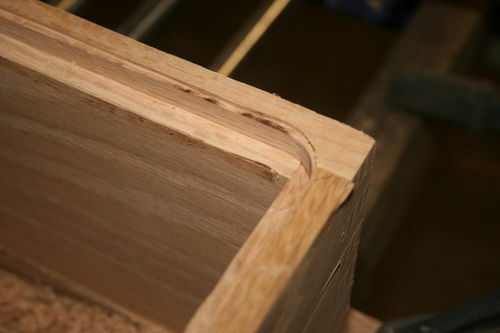 As you can see in the picture, the router bit left rounded corners. I used my chisels to square off each corner. Up to this point I’d used power tools for everything. Using the chisel I get first hand experience with the density of the oak. Not only was it slow going for the chopping, but I found that the oak had a tendency to break instead of cutting clean. I actually broke one of the finger joints off while I was chopping. I thought my chisels were pretty damn sharp, but I guess they weren’t sharp enough. With the chiseling done, I decided to give the back panel a quick sand down before inserting it. 120-220 to clean it up. 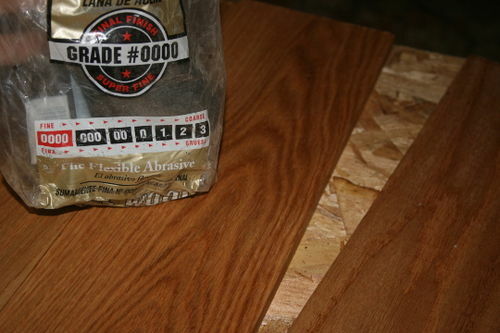 I used Baltic birch, mainly because it was what I had on hand. Speaking of using what I had on hand…. The plans in the book call for using a 24” piano hinge, mortised into the cabinet face frame and the door. I didn’t have any on hand, and when I went to Home depot to pick a piano hinge up nearly all of the employees looked at me like I had an extra head growing out of my shoulder. Rather than driving around town looking for piano hinges I decided to use a set of small brass hinges that I had at home. I bought them for a different project once upon a time and decided I didn’t like the color. No mortises required for these, simply marked them up, drilled pilot holes and attached them. I stripped a few of the brass screws out and had to drill the pilot holes larger. Oak is pretty tough stuff! Attaching the door to the frame was pretty uneventful, but exciting because it started to feel like I was in the home stretch. If you look in the picture above you can see the glass is cracked. I took the cabinet upstairs into the house to hold it up and see how it would look on the wall. While I was grabbing a coffee refill the cat jump onto the table and climbed on top of the glass door. The cold glass couldn’t hold him and cracked. Because the door is glued up I can’t pull the glass out and replace without routing out the back side of the frame. Down the road I will probable replace it with 1/4” glass, but for now I decided to leave it as it is. Back in the shop I pulled the door off, drill out the hole for the knob, did a quick test fit, and then took all of the hardware off so that I could apply the finish. I had initially gone back and forth about whether I wanted to wait and save all the finish work until the appropriate chapter in the book, but decided that I would finish as I go and pick one project along the way to save. For finishing, everything got a quick sand down with 220 to knock down any splintery stuff and any bumpy nubs. I also cut a few 1/4” thick pieces that would act as shelves inside the cabinet. I chose a finish I’ve fallen in love with recently. It’s a three part oil based finish consisting of equal parts Boiled Linseed Oil, Satin Polyurethane and Mineral Spirits. I liberally apply it to all parts with a soft cloth, let it soak in for 20-45 minutes and then wipe all excess off with paper towels. Then I let it dry for 36-48 hours, and give everything a rub down with #0000 steel wool to knock down any nubs. I repeat 3-4 times depending on the level of finish I want to build. For this project I stopped at 3 coats since it won’t be beat on like a table or other piece of furniture. After the finish was dry I reattached the door and handle hardware and inserted all of the shelf pins. 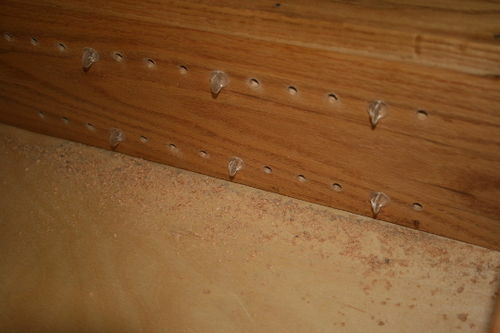 I had to drill out some of the holes a little deeper so that the pins would sit flush. With the pins in I added the shelves and took a final picture. Measure everything – even when following plans. The accuracy of all of my joinery could have been better if I would have taken a little more time marking and double checking all my measurements. The Finger joint jig is awesome! I had been putting off building one for a while. I’m definitely glad I finally did. I already have plans to use it for some of my own designs in the future. Now that I understand the basic premise behind it, I feel like I can scale it up and down to get a large variety of finger joints. Stop blocks/set up blocks on the table saw fence increase accuracy and speed of setup I had seen this done before but never used it. Always thought it seemed kind of silly, since I could just measure and layout each cut. Now that I’ve used stop blocks on the table saw fence I don’t think I can go back to not using one. They made it possible to get extremely consistent/accurate cuts when there was a lot of repetition. 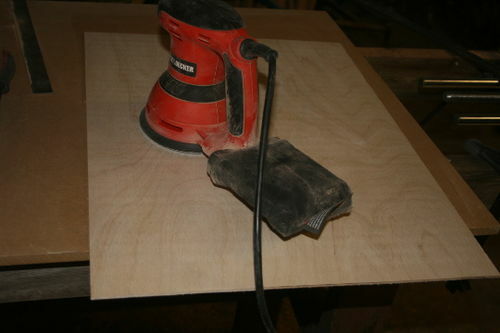 You can create accurate shelf pins without a drill press Up until this point I have avoided projects that I didn’t have the “right” tool for or rushed out to buy a tool just because an article or plan says I should use it. It might seem silly, but it was a good lesson to do the layout by hand and see that if I just took my time and thought things through, I could get similar results without the “right” tool. 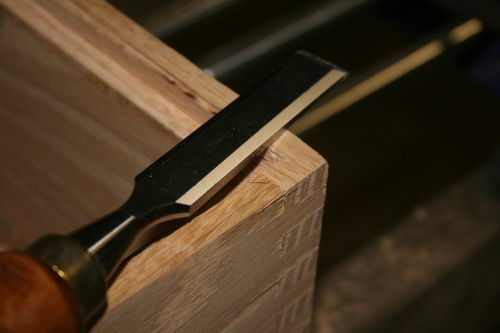 Use backer blocks when cutting oak – especially dados I had to fix splinter blown out/tear out on some of the lap joints because the dado blade beat it up on the exit cut. Afterward I thought about it and I’m pretty sure it could have been avoided if I had put another piece of wood behind it – similar to the way you can minimize tear out when drilling through a piece. Finally, Cold glass + fat cat = angry wood worker. Overall I’m very glad that I decided to start this New Yankee Workshop project. Just from the first build I feel like I picked up some new things, even though I didn’t follow the project to the letter. I’ve already started on chapter 2 – the Workbench build. I will work to get the blog posted sometime soon. Looks like a good first project from the book. Looking forward to the next entry. Here is a little hint on the brass screws. After drilling the pilot hole, drive a regular steel screw the same size and thread into the hole before trying to screw in the brass screw. 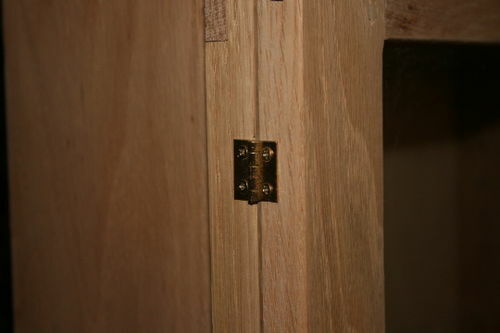 This will tap threads into the hole and keep you from messing up your nice brass screws that come with the hinge. Thanks Lifesaver! That is an awesome tip! I ruined quite a few of them in the process. I am going to make it a habit to grab a handful of steel screws the same size when I buy brass hinges from now on. Great looking project! Good job. Lifesaver gave you a good tip so I’ll try mine: instead of chiseling those rabbited corners round, I usually round the corners of the panel with a disc sander. Pencil the radius and sand to the line, done! gfadvm – I would have never thought of that, and I think it would have worked really well – Thanks!